A little about this band. They consist of John Whiteleather, Cliffe Shoose, and Mary Beth Ponder. John on guitar/vocals has been a full time touring musician for many years. Has lived and toured all over Europe and the United States, as well as releasing many cd’s on small european labels. Cliffe Shoose has been a Sarasota icon for many years with his amazing stand up bass playing and performance antics. Mary Beth Ponder on violin/vocals has performed a decade locally in The Swamp Donkey Band along with John Whiteleather. 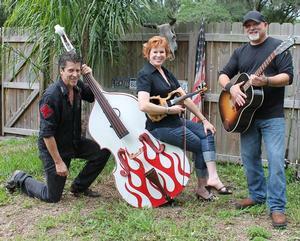 These three seasoned musicians bring Classic Rock, Old Country, Americana and Rockabilly to the areas most popular venues. Local and tourist destinations such as Siesta Key Oyster Bar, Owens Fish Camp, Sun N Fun RV Resort, Lazy Days Campground, to name a few. The music is acoustic driven with audience interaction and a danceable energy. Songs covered are from such artists as Bruce Springsteen, John Mellencamp, Eagles, Johnny Cash, Rolling Stones, Waylon Jennings, Merle Haggard, America and more.